Last week, we had the opportunity to talk with USA Truck driver Darnell Rhodes. 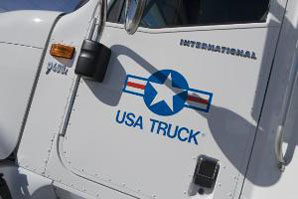 Darnell has been driving with USA Truck for about five months and is a great resource for entry level truck drivers and those interested in pursuing a truck driving job. We discussed a lot in this interview, so stay tuned for parts 2-4 over the next week! To start off, let's find out why Darnell got into truck driving and what his CDL training experience was like! Q: What were you doing prior to being a truck driver and what made you want to get into the industry? A: I was a correctional officer for 6 years, but prior to that I had actually driven trucks before. Times got hard, jobs started laying off, and it got time for me to make a decision, and truck driving was the best thing going. Plus, I missed being out on the road seeing different sights and all that. Q: How did you come across Driver Solutions? A: I found ya’ll by actually going to sign up with PAM Transport and they directed me to Driver Solutions. I enjoyed you guys compared to the company I went with before when I was on the road. The recruiter I had did his best to work things out for me. I had to change my class date a couple times and he had no problem doing that for me. All in all the experience was pretty awesome! Q: Tell us a little bit about your CDL training experience. A: I loved the staff at my school. They had awesome staff and instructors there. They took the time to sit down with everybody that was having problems and also took time out after hours to help. Some instructors would stay around and help out the students that were having problems. That’s something I can say about the Little Rock trucking school compared to the other school I went to. At C1 Little Rock they knew if you were having problems. They’d have staff willing to stay late. They had instructors willing to stay late at night so those students who were struggling wouldn’t feel pressured to impress the other students during the day. It would just be them and the trainer by themselves in the truck. Q: Can you tell us a little bit about training OTR with your company trainer? A: My trainer was real nice and I enjoyed him. He made truck driver training fun! He called me about a day or so in advance and asked when to pick me up, told me where he’d get me, told me to get plenty of sleep and what to bring. What to bring varies by trainer, but the main thing is to bring clothes for about a week. The truck stops have Laundromats. You got to realize that there’s going to be 2 of you in the truck, so don’t try to bring your whole house. Both of you will be crammed in the same space so try to bring the least amount possible. Remember, it’s the trainer’s truck so whatever he says goes. He’s got the experience. He’s the one that was chosen to be a trainer. There’s a reason why the company chose to let him become a trainer. If you get agitated at the way he talks, you got to realize he has a stressful job. He’s trying to teach someone brand new how to do the job ON the job and on the highway surrounded by the general public. Be sure to check back for the second part of our interview with Darnell where we discuss miles and home time!